published by ACRES U. S. A., Austin, TX 2013 www.acresusa.com softcover, 329 pages, $30.00. The opening seven chapters take the reader through the current crisis in American agriculture, the poor track records of civilizations based on annual crops, the history of agroforestry, the natural habitats of post-Ice Age North America, and basic strategies of Restoration Agriculture. The next five chapters cover livestock, bees, and human nutrition. 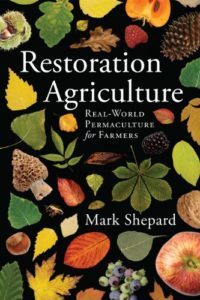 Chapters 13 through 16 are how-to guides for starting a Restoration Agriculture farm or converting a conventional one. There is an entire section of color photos from New Forest Farm — Restoration Agriculture in action. The book includes dozens of examples from the farm, plus citations of agroforestry research and nutrition information. The author notes the absence of waste since the animals eat the produce that is not sent to market or consumed by the farm family. Livestock is treated humanely. In the climate of Wisconsin autumn cold weather can cause the chestnut husks to snap shut, which ruins the nuts for human or animal consumption. When Mark is collecting chestnuts to use for seed, he selects the early-ripening ones in the hope that the early-ripening trait will be passed on. Another example is growing culinary and medicinal fungi on dead logs and branches that are by-products of the polyculture system. Throughout his work, he has used the post-Ice-Age “oak savanna” of North America as a model (based on careful research into prehistoric ecosystems). Each species — chestnut, apple, hazelnut, raspberry, currant, grape, fungi, grasses, etc. — occupies a specific niche and receives a share of the available sunlight. Mark Shepard does not approve of nibbling hazelnuts and chestnuts at holiday time — he advocates using them as staple foods for everyday nutrition. “We will need to invent harvesting, maintenance and processing machinery for use in polyculture systems”. If you don’t have time to read the entire book, definitely read the last two chapters: “Making a Profit” and “Creating Permanent Agriculture: A Call for New Pioneers.” These two chapters sum up the author’s arguments and lay out the choices before us. Professional farmers in sustainable enterpris-es will be pleased with his honest assessment of farm economics. The author mentions the urban agriculture non-profit “Growing Power” as an example of taking action rather than just talking. The agriculture crisis is serious, but this book is not doom and gloom. “As we begin to upgrade the health of the actual ecosystem it becomes more per-ennial, the soil improves, and the species diversity increases. Then more yields are harvested. The system ultimately creates more niches. More niches mean more livelihoods for more plants and animals — and more niches for people as well”.